End-of-life discussions with your family can be uncomfortable and full of mixed emotions. However, in choosing Holzer Hospice, individuals are provided peace of mind of knowing you are receiving the type of care you need and want. Holzer Hospice, a licensed, certified program that provides in-home along with contracted nursing home services to patients with life-limiting illnesses and families, officially began providing care to the southeastern Ohio region in 1994. Holzer Hospice provides services to the following counties in Ohio: Athens, Gallia, Jackson, Meigs, Vinton, and portions of Lawrence. The team at Holzer Hospice includes: nurses, social workers, nurse aides, department coordinators who assist with general office duties and bereavement services, billing specialist, and an in-take coordinator. In addition, Holzer Hospice utilizes volunteers to enhance our care program. “We have a great team at Holzer Hospice. 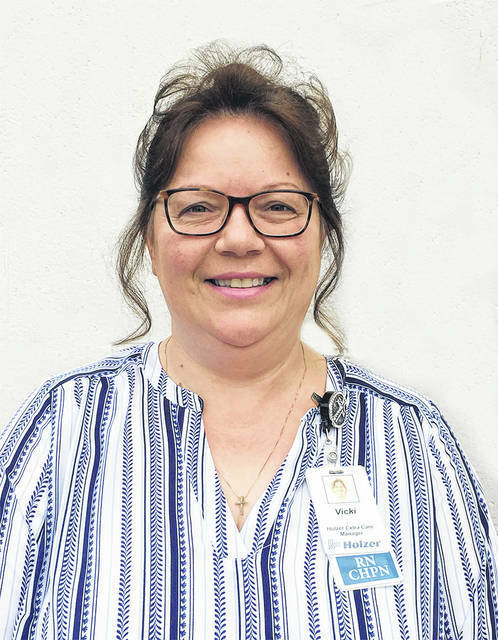 Our staff is very patient-centered to assure all needs are met for the individual and his/her family,” Vicki Nottingham, BSN, RN, CHPN, Director of Hospice and Extra Care stated. Staff operate on a team approach called the Interdisciplinary Team (IDT) to provide exceptional care. The IDT is available 24/7 and consists of a variety of providers including the medical director, primary care physician, nurse case manager, aides, social workers, local pharmacies, volunteers, and music and physical therapy individuals working together to ensure the patient’s care plan is effective and if it is not, taking measures to improve on the plan. Hospice volunteers make up a big part of the IDT and are always in demand. Volunteers at Holzer Hospice provide companionship, offer support to the patient’s family and caregivers, and help with community outreach and fundraising. By becoming a hospice volunteer, individuals gain great personal satisfaction from knowing that you have made an impact in another person’s life. All Hospice volunteers, aged 18 and up, receive necessary training to work in the department. Volunteers can perform multiple tasks, each individual’s tasks are customized to his/her comfort zone. A caregiver working in this type of healthcare environment may find that he/she is drained emotionally and physically. In order to be successful at being a Hospice Care worker, you have to be willing to help the patients maintain their quality of life and build relationships, even when rough days happen. “Hospice staff need a love for nursing and for people; that’s what gets me through the hard moments. I can be having a rough day and visit a patient who is very upbeat and positive, and it turns everything around. Caring for hospice patients is a gift,” Nottingham shared. A Hospice Care worker can find satisfaction and take pride in the type of care provided when the little things make the biggest impacts on the patients and their families. “Seeing a family grant that patient’s last wish of being home in their own environment is so satisfying. The little things the patient’s express and family helping with the last part of life; it’s rewarding,” Nottingham said. Hospice care is full of memories that leave a family knowing their loved one was happy and content with where they were during the end of their life. That is what makes Holzer Hospice important to not just the family, but the staff as well. “The end of life is just as important as the beginning. Coming into the world is so important and exciting, but the end of life should be the same. When the family surrounds the patient at their bedside, and the patient is peaceful and where they want to be, it’s a memory that lets them know the end of life was just as good as the beginning,” Nottingham said. If you or someone you know would like to learn more about Holzer Hospice, visit www.holzer.org or call 740-446-5074. Staff is available to assist you with any questions.